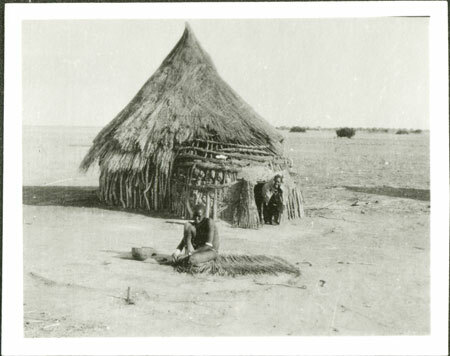 In the foreground a woman is sitting weaving a mat from plant stems, whilst behind her another woman is kneeling in the elongated entrance-way of a stake-walled village hut, with some sort of covering over her head. This image is part of a film some of which includes Nuer Lou near the Sobat River, dating this image to Evans-Pritchard's 1931 fieldwork period. Note on print reverse ms pencil - "2 103 "
Morton, Chris. "Nuer hut and mat-weaving" Southern Sudan Project (in development). 03 Jan. 2006. Pitt Rivers Museum. <http://southernsudan.prm.ox.ac.uk/details/1998.346.103.2/>.